So, this may be known by pretty much everyone else in the world, but I decided to leave a few of my ground cherries in the husks to ripen more off the plant, and WOW! It seems like the flavor increased tenfold. I'd just been eating them as the fell from the plant, but no more. Well I wouldnt eat more than a berry a week. It shouldnt contain any Solanine but it is edible. 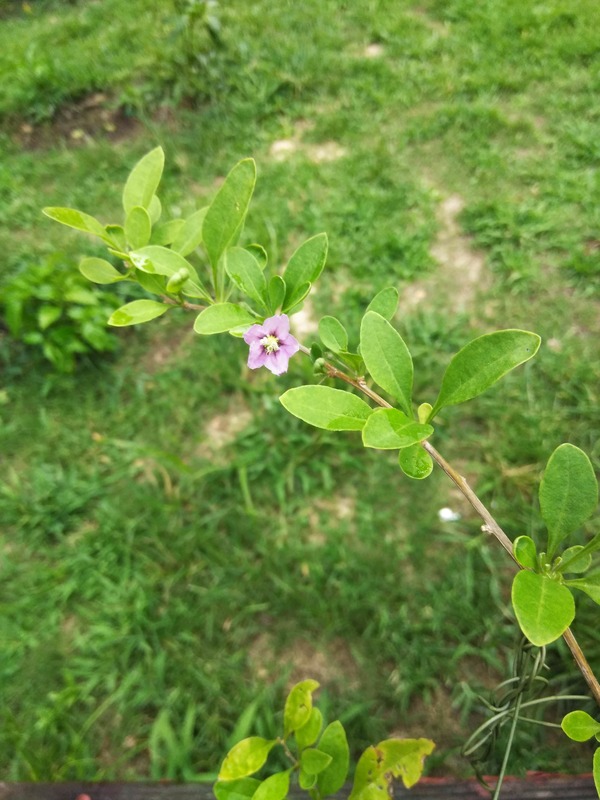 So I left a few suckers from my goji in a one gallon pot (the ones I mostly care for are sharing a pot with a pepper) and I noticed a flower and some buds today. I'm also getting ground cherries daily by watering when it wilts and shaking the plant at the end of the day. 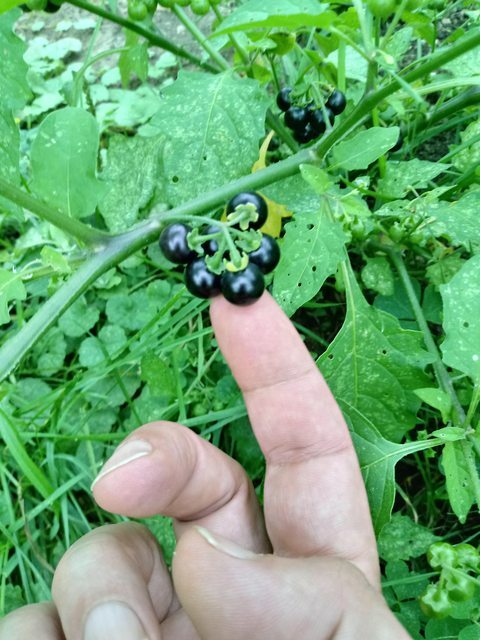 I've got some pretty sweet Black Nightshade growing in my yard here that came with the house.. Pretty sure these are S. ptychanthum (Eastern Black Nightshade). I dried small number of these this year for seed. They really love to spread out..
Last year I grew Solanum caripense, Solanum quitoense, and Solanum muricatum. Favorite of the 3 was the quitoense. Plant just looks wicked. The aniomalum looks interesting. Wondering if it has any cross compatibility with capsicum. Did you grow the Muricatum from seed or a clone? Also, where did your production go wrong that you weren't able to achieve ripe fruit? I read they do well in greenhouses. I wonder if those are any different than schwartzbeeren. Not going to lie, I haven't yet, but I'm resolved to this year. I used to eat them here and there when I was a kid.. Then I started reading field guides and got scared straight. From the sounds of it, the Black Nightshades are all fairly similar. I'd love to compare the different varieties too though. 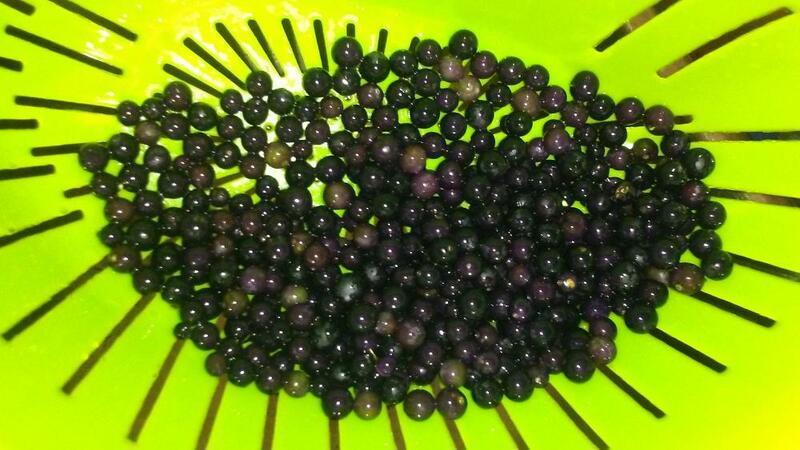 I'm soaking one of the berries now to get some seed to start, I'm sure there's more than enough to go around if you want to try some out. I'm a sucker for Germanic Heirlooms, especially Nightshades! Sent you a list of other seed you may be interested in. I wish I had the actual genetics my great grandmother grew. These came from another person of Volga German decent, Samuel Brungardt. It is originally from Ellis county Kansas. My family is from Ness City, which is in Ness County Kansas. Seems like they are still sorting out the different species of these, maybe you could find someone working on it that is profiling them. Most of the species indicators seem to be fruit evident. Shiny vs. buff, 5-7 vs 5-10, raceme vs. cluster. etc. I would think a better species key isn't long off if it doesn't already exist. The volga germans brought these from Russia when they immigrated here. Hopefully they are noticeably different than the other ones you are growing. The berries look identical to the ones in your picture from what I can tell. I think deadly nightshade looks the same too though. Number and arrangement of berries.. I'd be surprised if you couldn't cross most of them too. Deadly Nightshade (Atropa belladonna) fruits occur singly, not in groups.. Best way to to avoid them. There are other differences, but that's the easiest way to differentiate. Most of the poisonings attributed to the ripe berries of the "Solanum nigrum complex" seem to come back to Atropa belladonna. Common names can kill you. Some of these they are using anther length to identify. Sandra Knapp is one of the most knowledgeable persons on the planet when it comes to Solanums. If you are really interested,I would contact her with photos. That would be an intergeneric hybrid. It's possible but ridiculously rare. It could be a cool project though. T.anomalum is a fun one to grow by itself even. Thanks!! I'll have to look her up! Is there a workable key available that includes the anther length?